There are several methods of earthing like wire or strip earthing, rod earthing, pipe earthing, plate earthing or earthing through water mains. Most commonly used methods of earthing are pipe earthing and plate earthing. These methods are explained below in details. Earthing mat is made by joining the number of rods through copper conductors. It reduced the overall grounding resistance. Such type of system helps in limiting the ground potential. Earthing mat is mostly used in a placed where the large fault current is to be experienced. While designing an earth mat, the following step is taken into consideration. In a fault condition, the voltage between the ground and the ground surface should not be dangerous to a person who may touch the noncurrent-carrying conducting surface of the electrical system. The uninterrupted fault current that may flow into the earthing mat should be large enough to operate the protective relay. The resistance of the ground is low to allow the fault current to flow through it.The resistance of the mat should not be of such a magnitude as to permit the flow of fatal current in the live body. 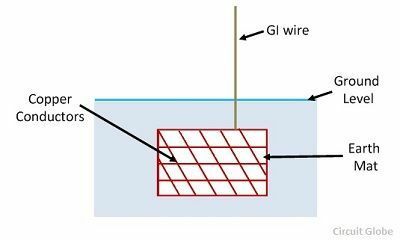 The design of grounding mat should be such that the step voltage should be less than the permissible value which would depend on the resistivity of the soil and fault required for isolating the faulty plant from the live system. In this type of earthing any wire, rod, pipe, plate or a bundle of conductors, inserted in the ground horizontally or vertically. In distributing systems, the earth electrode may consist of a rod, about 1 meter in length and driven vertically into the ground. In generating substations, grounding mat is used rather than individual rods. 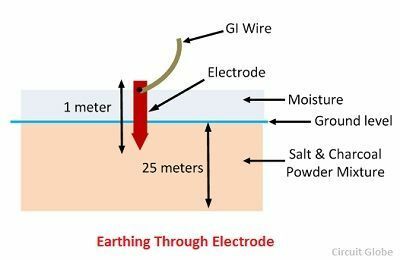 This is the most common and best system of earthing as compared to other systems suitable for the same earth and moisture conditions. In this method the galvanized steel and perforated pipe of approved length and diameter in place upright in a permanently wet soil, as shown below. The size of the pipe depends upon the current to be carried and type of soil. Normally, the size of the pipe uses for earthing is of diameter 40 mm and 2.5 meters in length for ordinary soil or of greater length in case of dry and rocky soil. The depth at which the pipe must be buried depends on the moistures of the ground. The pipe is placed at 3.75 meters. The bottom of the pipe is surrounded by small pieces of coke or charcoal at a distance of about 15 cm. Alternate layers of coke and salt are used to increase the effective area of the earth and to decrease the earth resistance respectively. Another pipe of 19 mm diameter and minimum length 1.25 meters is connected at the top of GI pipe through reducing socket. During summer the moisture in the soil decreases, which causes an increase in earth resistance. So a cement concrete work is done to keep the water arrangement accessible, and in summer to have an effective earth, 3 or 4 buckets of water are put through the funnel connected to 19 mm diameter pipe, which is further connected to GI pipe. 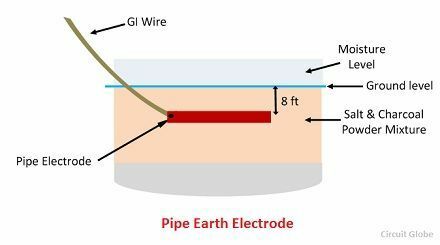 The earth wire either GI or a strip of GI wire of sufficient cross section to carry faulty current safely is carried in a GI pipe of diameter 12 mm at a depth of about 60cm from the ground. 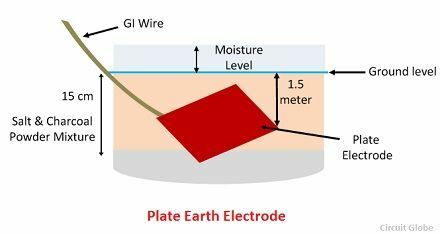 In Plate Earthing an earthing plate either of copper of dimension 60cm×60cm×3m of galvanized iron of dimensions 60 cm× 60 cm×6 mm is buried into the ground with its face vertical at a depth of not less than 3 meters from ground level. The earth plate is inserted into auxiliary layers of coke and salt for a minimum thickness of 15 cm. The earth wire (GI or copper wire) is tightly bolted to an earth plate with the help of nut or bolt. The copper plate and copper wire are usually not employed for grounding purposes because of their higher cost. 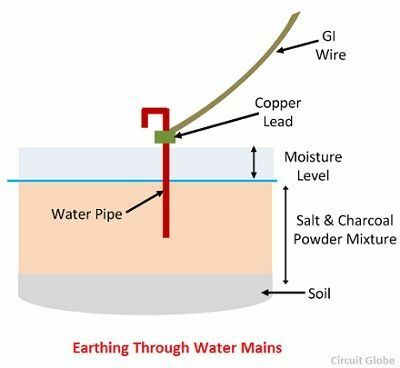 In this type of earthing the GI or copper wire are connected to the water mains with the help of the steel binding wire which is fixed on copper lead as shown below. The water pipe is made up of metal, and it is placed below the surface of the ground, i.e. directly connected to earth. The fault current flow through the GI or copper wire is directly get earthed through the water pipe.